If your basement was built with windows, the seals around your windows may wear out as the years go by. If you have experienced this in your own home, gravity will pull drainage from heavy precipitation or snow-melt down into your basement through weak points in the window seals. For many of our customers, window leaks are even more intense if the window well is clogged in such a way that causes water to be prevented from draining away properly. If your home has excess moisture running down the walls of your basement, stains on the walls or floors, or if you have sometimes noticed stagnant puddles of water, you could have leaks in your basement windows. There are many adequate methods to resolve the problem, including reliable interior water removal systems which are designed to divert water directly to a drainage system. On the exterior of your home’s foundation, a waterproof membrane should be installed along the foundation wall to stop moisture from entering your basement at the base of the window and/or foundation while sending the moisture into a sump pump which will guide the water a safe distance from your home. Also, some of our clients may elect to install new drains in window wells. Please contact us today and we will schedule a free, on-site assessment at a time of your convenience anywhere in our city and our surrounding service area. 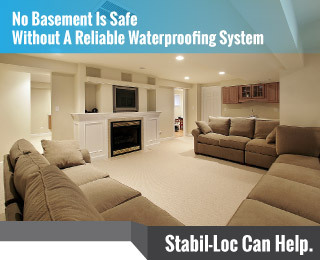 Don’t let the stress of a lingering foundation or basement repair issues bother you any longer.